I don't like the search box when I'm flagging for a duplicate, because I don't know the exact names of the big questions. Even if I use very relevant keywords, the question that I want to pick is always lost somewhere in the list and I have to scroll down and search for it. How do you guys find and pick the duplicates quickly? 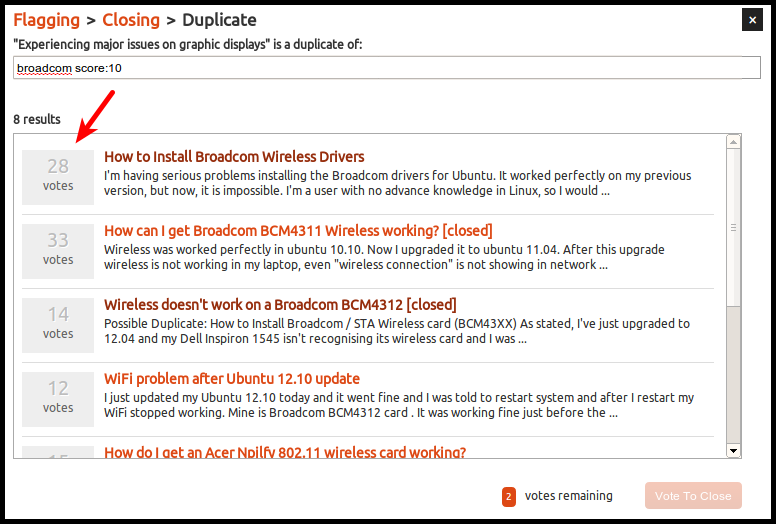 Example: I want to flag a question as a duplicate of the oh-so-famous How to Install Broadcom Drivers question, but when I search "broadcom drivers", it's not at the top of the list (and depending on the question, it's sometimes not even in the list). I always forget the exact name of the question too. How do I quickly search for it? What I usually do is use the score:# option. score:10 means "show me questions with a score of 10 or more". This removes those low-score questions from the list, making it easier to spot the question you're looking for. Of course, you don't always have to use the number 10; this is just an example. If you know the question is really popular and has, let's say, 90 upvotes, then you could use a higher number. If, however, you're searching for a question that has a relatively low score, you'll need to do some trial-and-error, using score:3 for example, to exclude other low voted questions. An alternative would be to have those questions in your favorites, and use the option infavorites:mine, which will only search for questions in your favorites. Not the answer you're looking for? 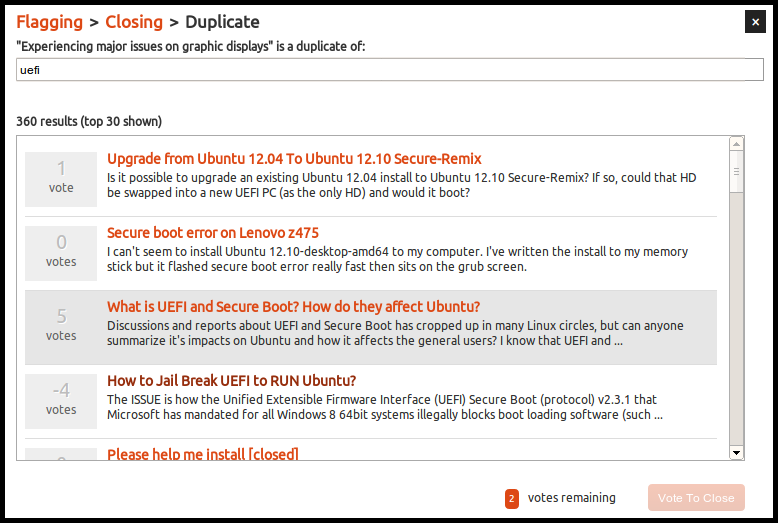 Browse other questions tagged support duplicates searching . would be possible to change the layout of suggested questions? 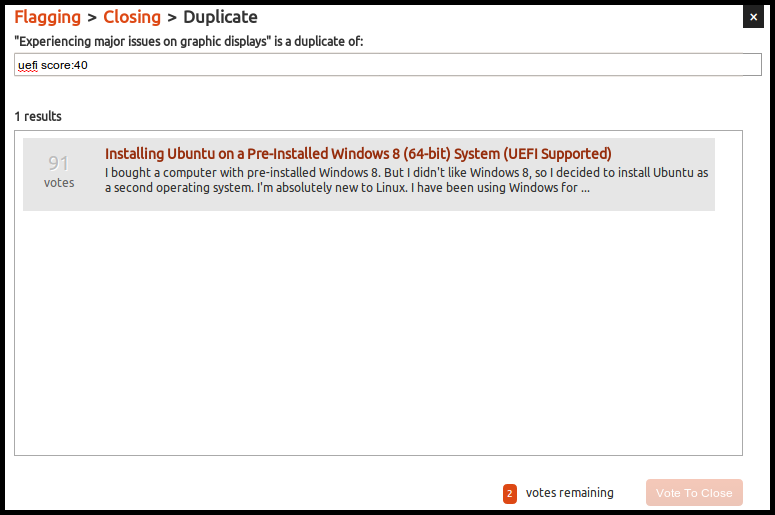 Could be possible duplicates arranged by votes in addition to default order? 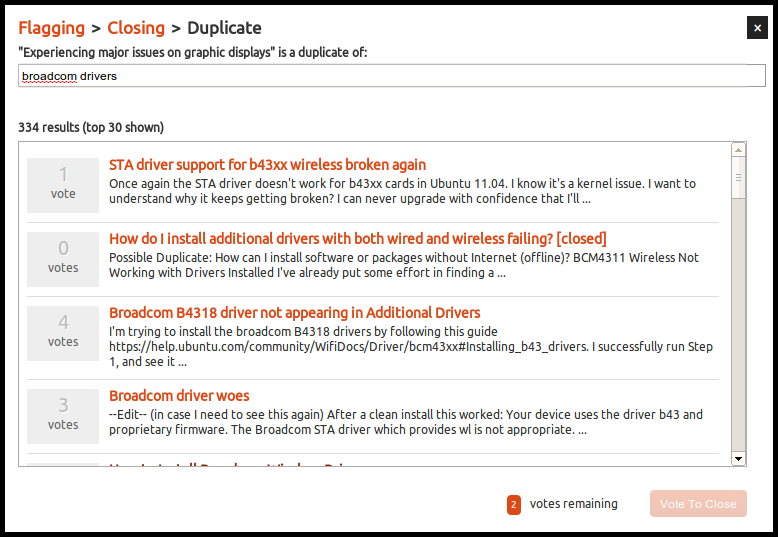 'closed as exact duplicate by…' is confusing - where is the answer?